Soft and smooth hair free skin is all you need. There are a lot of methods you can try to get rid of those unwanted hairs like waxing, hair removing cream and more advanced laser if you wish to have a permanent solution. While waxing can help you with smooth skin for a longer time, it is painful and hair removal creams can be messy. Therefore, the easiest way would be to go for a shave! 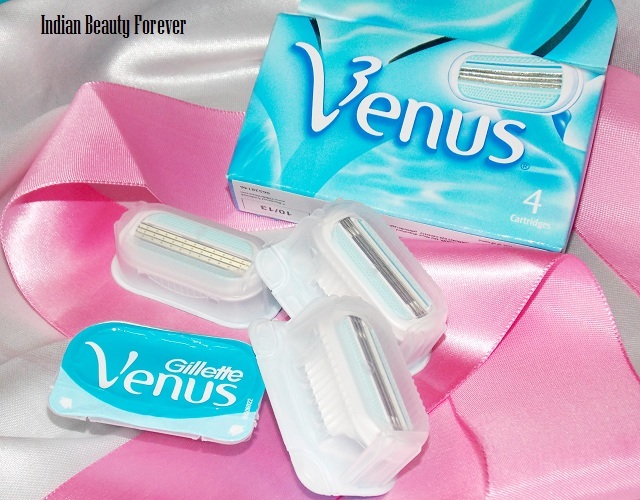 Gillette makes these amazing razors for keeping women in mind called Gillette Venus razor for women that is endorsed by Sultry beauty Chitrangdha Singh. You must have seen the advertisements in the magazines and newspapers. She says "Its simple and effective to get silky skin through out the year". For me hairy arms and legs is a big no no. Who's wants to flaunt hairy arms after all!! As I am using it I for the past couple of weeks, even I would agree. Its not that it was my first such experience, I have used razors earlier but the entire experience with this was pleasant. I was gifted this cute set for consideration. The round gift pack with hot pink ribbon bow looks girly and exudes oodles of cuteness. I am using this box to store my jewellery now a days! Ahh I love when the PR samples are nicely sent in gift packs! 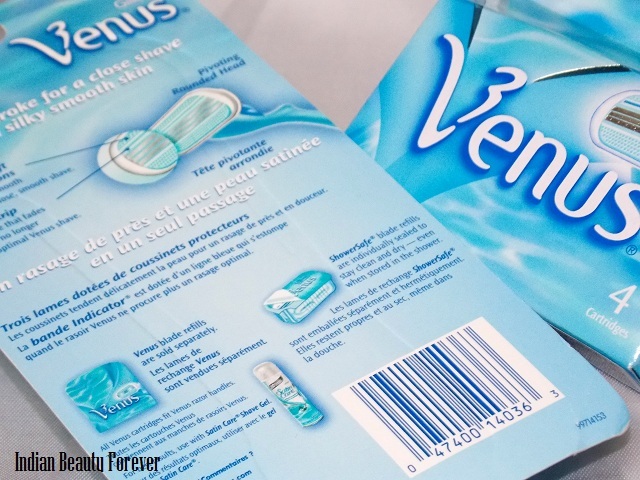 Price- Gillette Venus razor is priced at 199 with one cartridge already attached! Apart from that the separate cartridges pack is for 449 rupees and it contains 4 cartridges in total. Before, I start with the review let me tell you guys something. Some Shaving myths that are only myths and needs to be busted! Right Now!! 1. Shaving everyday can cause thicker, darker and hair to grow faster. Its a myth as the hair thickness etc depends on the genetics and have nothing to do with the shaving! Once you shave the blunt ends can make you feel as if they look thicker, but that is not that case. Shaving everyday actually exfoliates your skin and also prevents ingrown hairs. in fact shaving makes your skin smoother. Check out the pictures below, girlies!! Moving on with the review now! 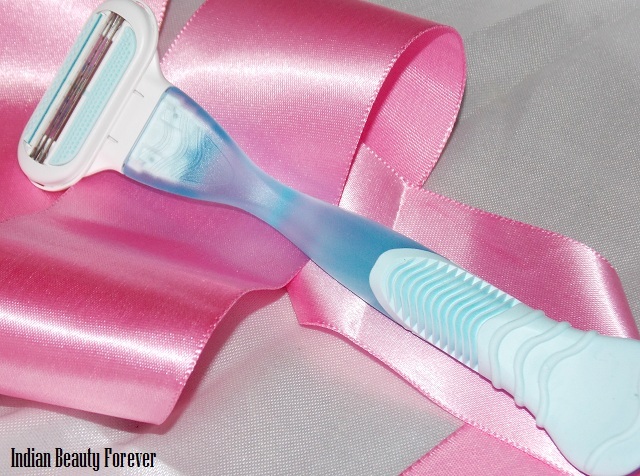 Experience- The Razor is a pretty blue colored, made up of fine quality sturdy plastic. Additionally, it had got rubber handle and ridges to give it a firm grip while you use. This arrangement gives you complete control over it, therefore, close shave with no cuts by accidental slip of the razor. 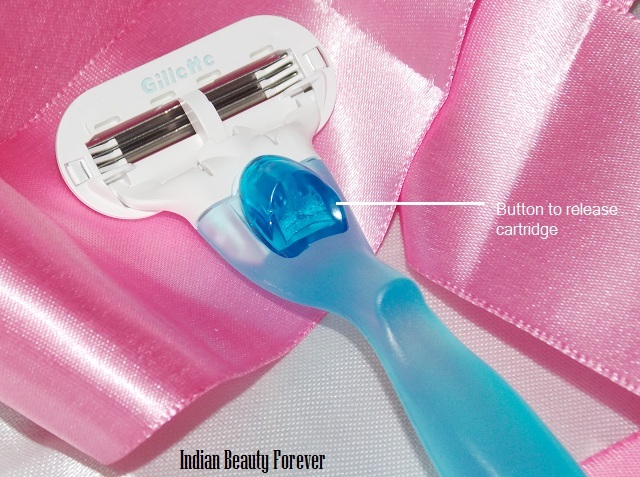 The cartridge is not permanently attached to the razor, rather it is disposable which makes it economical. You just need to push a button on the back of the head of the razor, doing so, will let the cartridge free and you may change it with the new one! The cartridge has three very fine blades, parallel to each other aligned at an angle and on both the sides they have got protective cushions, made up of rubber, I guess. Head of the cartridge is movable, it is designed like that so that while using it along the curves/contours it can automatically adjust itself. This is the feature what makes me like it a lot as while shaving on your knees for example, you need a razor that can move the blade so as to not have any cuts etc. You should always try to shave from the direction opposite to that hair growth for a closer and smoother skin. For under arms, try to share both upwards and down wards as he hair growth is not in a particular direction there. Moisturize once you are done shaving for softer skin. I am liking this razor a lot as compared with the other that I have used prior to this. You can get this from flipkart as I mentioned above! The single cartridge may last for around 4 weeks though it depends on your frequency, hair thickness etc. 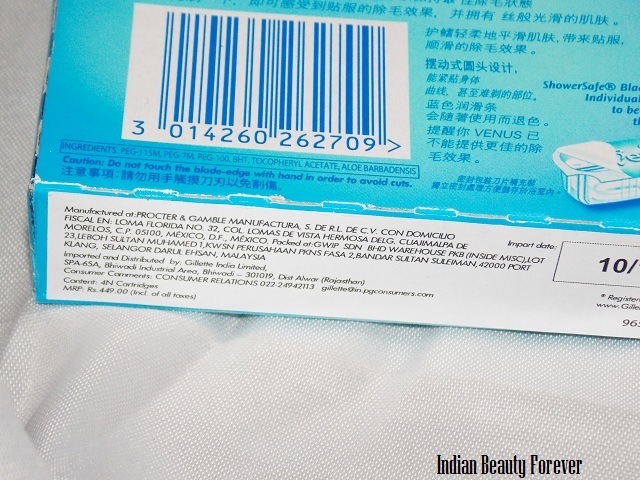 the cartridge has a blue strip with aloe Vera and vitamin E, This blue strip will fade when you are no longer getting a close shave which also means you need to change it!! I find this feature very helpful and quite unique! Take- After using it and getting a smooth soft skin with no mess, I would definitely recommend this. 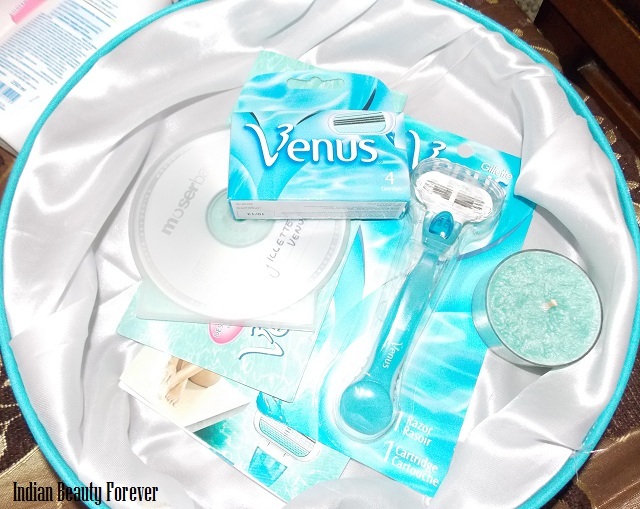 if you amongst those who uses razor to get rid of unwanted hair. Go for it, you will not be disappointed at such an affordable price! !